Bhutan’s currency, the Ngultrum, is pegged to the Indian rupee, and the country’s economy (one of the smallest in the world) is also dependent on India for trade. On Bhutan’s coins and notes, you’ll see a colourful window into the culture and political structure of the country with images of the current and previous kings, many Buddhist symbols, and much more. Want to learn more about Bhutan? Coins in Bhutan were minted by the Cooch Behar mint located in West Bengal in the foothills of the Himalayas until 1789. After that Bhutan started issuing its own currency in the form of coins called chetrum. These coins were made of hammered silver and copper, usually in denominations of ½ rupee until 1929, when more modern coins were introduced in denominations of 12 rupee and 1 paisa coins. Nickel ½ rupee coins were circulated in the 1950s. Cooch Behar coins continued to circulate at the same time as Bhutan’s currency. In 1957, Bhutan decimalised its currency, while the Bank of Bhutan was founded in 1968. The country soon underwent a period of increased monetisation, and the Ngultrum and chhertum were introduced in 1974. 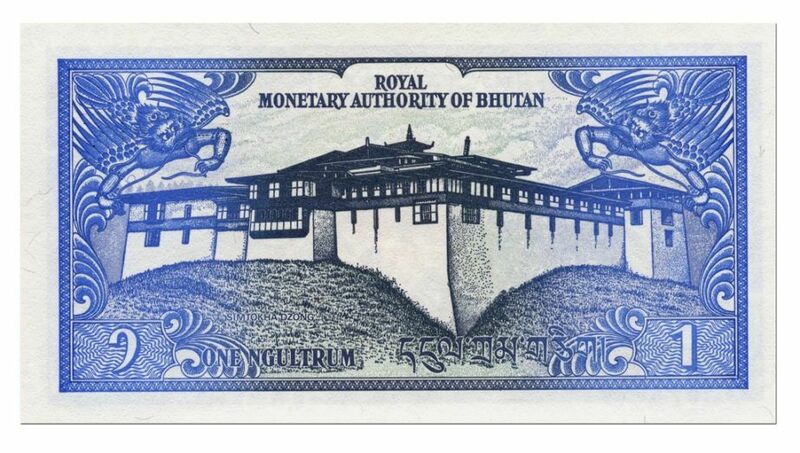 The Royal Monetary Authority of Bhutan took over the responsibility of printing notes in 1983 from the Ministry of Finance. The first set of coins in 1974 included a square Ch. 5 coin and a scallop shaped Ch. 10 coin. Today the Ch. 5 and Ch.10 are rarely used. The Bhutanese ngultrum is pegged to the rupee at par. It was valued at BTN 44.19 to US$1 on July 29, 2011 but has since fallen in value. In July 2012 the BTN was worth 55.3, a year later it was around 60 in July 2013, 64 in July 2015 and 66.7030 at the time of writing (November 1, 2016). Bhutan has one of the smallest and most underdeveloped economies in the world. 60% of the population relies on agriculture (primarily animal husbandry and subsistence farming) or forestry. India is Bhutan’s most important economic connection, due to strong trade links, financial aid, the pegged currency and Indian migrant labour for many development projects. 83% of Bhutan’s exports are shipped to India, with a further 10% to Hong Kong. 72% of imports come from China, and 6% from South Korea. Hydroelectric power also plays a crucial role in Bhutan’s current economy. It makes up 99.61% of the country’s electricity production and has substantially boosted GDP, making up 42% of exports from the country. Overall the country has high levels of growth. 9.7% in 2011, 6.4% in 2012, 3.6% in 2013, 3.8% in 2014, and 5.9% in 2015. Tourism is being cautiously pursued by the government, but only in a manner which is culturally and environmentally responsible. However tourism earnings declined last year due to devastating earthquakes. Bhutan’s small, underdeveloped economy is continuing to grow, but only under the watchful eye of the government. Economically and monetarily the country is tied to its giant neighbour, India. Continue exploring Bhutan with our Profile and Travel Guide! You can read more about the Indian rupee HERE.